2 of 5 Place chicken in a large pot and cover with water. Bring to a boil. Reduce heat and simmer gently, covered, for 10 minutes. Allow to cool and cut into 1/2-inch pieces. 3 of 5 Coat a 13 x 9 x 2-inch baking dish with nonstick cooking spray. Add burritos, cutting to fit in a tight single layer (you will need 10 to 12 burritos, depending on the brand). Scatter the chicken over the top. 4 of 5 In a medium-size bowl, mix together milk, soup, 1 cup of the cheese and the olives. Pour mixture evenly over the chicken and burritos. 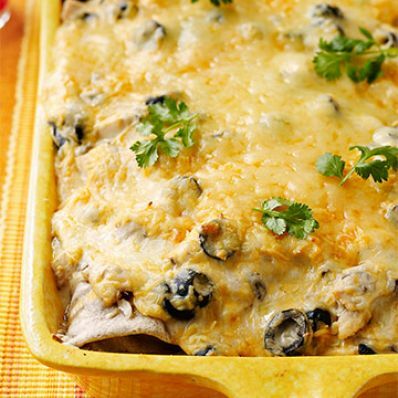 Top with remaining 1/2 cup cheese. 5 of 5 Bake at 350 degrees F for 30 minutes or until heated through and bubbly. Cool slightly before serving; sprinkle with cilantro leaves, if desired.